The Fills-All Model FA-R High Speed Rotary filler is expandable from 6-36 nozzles. Equipped with color coded tooless change parts and state of the art touch screen access panel capable of storing up o 150 recipes. All stainless steel frame chassis – 3” square tubing. Exclusive stainless steel dual manifold eliminates overflow tanks and unwanted spills. Tool-less sanitary clamps for ease of assemble/disassemble for cleaning. Watertight Nema 4 control box and components (24 Volt controls with safety lock out). Patented independent adjustable trimming (fine tuning) nozzle adjustments for up to 5/1000-inch accuracy are available (see options). 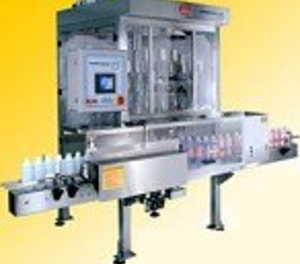 Rotary filling systems provides a smooth high speed filling system. Closed tip diving nozzles for foam control, no splashing. Top drive construction – variable speed drive system is away from wetted area. Stainless steel nozzles standard (available in all sizes and other materials available). Stainless steel and Lexan safety guards with interlocking safety switches. RS-232 available for linking machine and easy line integration. (Available only with touch screen controls above). Totally programmed Allen Bradley Microprocessor controls for repeatable and fast changeovers. (Available only with touch screen controls above). Clean product flow path – minimizes container pressurization. Comes complete with one set of change parts (timing screw, star wheels and center guide). Tool-less change parts for one bottle size – includes color-coded timing screw, star wheels and center guide. 11-1/2 foot long stainless steel frame conveyor with variable speed drive. Left to right travel is standard (3 feet intake, 2 foot discharge, 6-1/2 foot center section). All product contact parts of stainless steel and FDA approved materials. Models with 9 to 24 nozzles also available. Tank cover for product supply tank (#7 above). Approximate 50 gallon* per minute Stainless steel Centrifugal pump complete with DC variable speed drive mounted on plate with isolation pads to supply product to manifold.